Harriet (Hal) Westaway is down on her luck and pretty desperate when she receives a letter from a solicitor in Cornwall, informing her that she has inherited a substantial bequest from her Grandmother and that her presence would be appreciated at the funeral. Harriet would not think twice about this, were her own grandparents not dead for twenty years already. Deciding to go to the funeral out of curiosity, Hal vows to tell the truth as soon as she arrives. But she is not expecting a kindly solicitor or a welcoming family of “uncles” and cousins. Hal is sidelined by the intrigue she has for her newfound family. For although she is not the Harriet Westaway they are looking for, she is still a Westaway. And there are things that she doesn’t know about her Mother’s life before her that she is determined to find out. For this reason, I couldn’t help but like Harriet, though at times I wanted to shake or shout at her to stop what she was doing and think about the consequences. 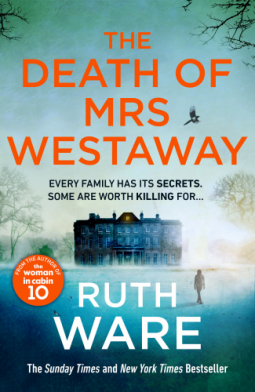 The death of Mrs Westaway is another brilliant Ruth Ware novel that has something for everyone. The Death of Mrs Westaway is available now via Amazon online and all good book shops.